The Quetzalcoatl story hangs somewhat like an urban legend throughout American esoteric circles. Most people believe Quetzalcoatl was a white god figure who came mysteriously among the Aztecs, gave them direction for living, and then left them with a promise to someday return. The belief among the Aztecs that their white god would someday return is told as the reason why the Aztecs submitted without a fight to a small band of Spanish conquerors, led by Hernando Cortez, in 1518. That Cortez and other Spanish conquistadors were followed into Central America by Catholic priests, who ravaged the cities and destroyed all record of the native religious life and their history, including priceless libraries of books carefully hand-written on bark paper, can perhaps be blamed for the twisted mythology. The name Quetzalcoatl meant “feathered serpent” and was a name given to numerous kings, or rulers of the early empires of the Toltecs, a civilization that preceded both the Aztec and Mayan nations in the same area. 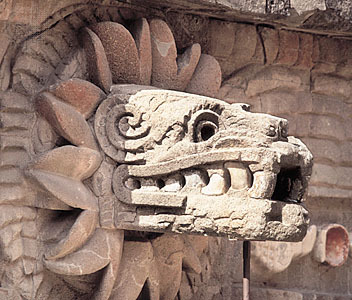 From surviving documents and rock carvings, historians believe the origin of the Quetzalcoatl myth lies in the story of a Toltec ruler named Topiltzin, a powerful leader who conquered the smaller tribal villages throughout Central America and built the Toltecs into an important cultural center between about 900 to 1200 AD. In the myth, Topiltzin, the son of a warlord named Mixcoatl, bolted from his mother’s chest a full-grown man dressed for battle. The legend places his birth at Xochicalco, a classic era city in the Valley of Mexico. Mixcoatl and his son conduct successful campaigns, building a Toltec empire. Archaeological record supports the fact that there was a literal explosion of Toltec influence in the area at about 950 AD. The myth continues with twisted Christian roots in the story of Topiltzin’s son, Quetzalcoatl Huemac, the successor to the Toltec throne, is driven from power by Tezcatlipoca, leader of the Chichimecs in the North. As the empire falls, Huemac destroys the cities, burns the temples, and orders all of the sacred books and treasures hidden high in the mountains. Eventually Huemac is forced by the demonic minions of Tezcatlipoca to give up his knowledge of craft and science and the arts. Finally, alone on the Gulf Coast at Acallan, Huemac immolates himself in a sacred bonfire. As he burns, his spirit rises up to become Venus, the Morning Star. With his passing, the Toltec Era is brought to an end. The parallels with the Jesus story in the Christian myth are remarkable. While not put to death by soldiers from a ruling empire, Huemac is driven to his death by an invasion. And like Jesus, his death signals the end of his mortal kingship. Also like Jesus, Huemac and his father, Topiltzin, are associated in the myth with the people and exist as mortals. Both Jesus and Quetzalcoatl appear in mythology as if they really existed, although there is no proof to be found that they were real persons. It is interesting that the spirit of Huemac becomes Venus, the Morning Star. This is the very name of Lucifer awarded in the Old Testament to the so-called fallen angel that the Christians believe is now ruling the Earth under the name Satan. As one writer expressed it: “Quetzalcoatl is to the New World what Christ is to Europe: the center of a religious cosmology and pre-eminent symbol of the civilized nations of Mesoamerica. Both men were considered to be men who ascended into heaven upon their death; Christ to sit at the right hand of God, Quetzalcoatl to become the Morning Star. Even though these two civilizations existed at opposite ends of the Earth, and at about the same time in history, the same basic story has evolved in local mythology. Like a contemporary movie script, the plot is the same, but the characters and their interaction are altered.